Funeral Services for Joyce Davis will be held at 10:30 a.m. on Monday, December 3, 2018 at the Holly United Methodist Church in Holly, Colorado with Pastor Kathy Leathers officiating. Interment will follow in the Holly Cemetery. Visitation for Joyce will be held on Sunday, December 2, 2018 from 3:00 p.m. until 7:00 p.m. at Valley Memorial Funeral Chapel in Lamar, Colorado. Joyce Colene (Hartshorn) Davis was born on November 5, 1927 in Ford, Kansas to Wallace E. and Edna Grace (Stwalley) Hartshorn. 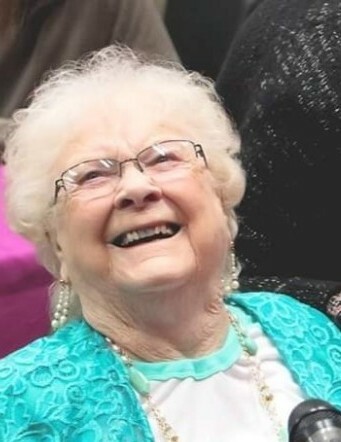 She passed away on November 27, 2018 at Memorial Hospital in Colorado Springs, Colorado at the age of 91. Joyce and her nine siblings grew up on a farm that was one mile east of Holly, Colorado. Joyce, being the oldest, learned to become a second mother to her younger siblings. She helped with cooking, laundry, canning, babysitting, and much more. Joyce graduated from Holly School. She met William Davis in 1949 and they were united in marriage on March 5, 1950 at the Holly United Methodist Church. To this union were born three children-Thomas William in 1951, Jerry Wesley in 1954, and Christy Lynn in 1955. Joyce worked for her father at his implement dealership. She was the bookkeeper for her husband Bill’s business and spent many years as a bank teller at both the Bank and Credit Union in Holly. Joyce also help her sons in their pharmacies however she could. Joyce was a devoted wife, loving daughter, sister, mother, grandmother, great grandmother, great great grandmother, and aunt who was a truly inspiring woman for her family and the future generations. She was very involved with her family and enjoyed volunteering for anything her children were in. She instilled strong ethics and values in her family. Joyce is greatly admired by all those whose lives she touched. Joyce is survived by her children, Thomas (Cathy) Davis of Eads, Colorado, Jerry (Peggy) of Ordway, Colorado, and Christy (Mark) Dobrovolny of Lamar, Colorado; siblings, Pat Daniels, Ramona Carnes, Kay (Eldon) Frey, and Dianna (Bruce) Ham; 12 grandchildren; 22 great grandchildren; one great great grandchild; special friends, Tracy and Glenn Smith and family; numerous nieces and nephews as well as many other relatives and a host of friends. She was preceded in death by her parents; husband, Bill in January of 2004; and siblings, Bud, Babe, Max, Donnie, and Linda Rose. Memorial contributions may be made to Holly Ambulance or Prairie Pines Assisted Living in care of Valley Memorial Funeral Chapel, P.O. Box 950, Lamar, CO, 81052.